The Muse, the traditional dispenser of inspiration, is a concept that has come down to us from classical times. In this rendition she has a rather terrifying aspect: she is both the slayer of heroes and the succour of the bereaved. The two masks complete her traditional tripartite aspect, a tradition that has been associated with the Great Goddess for thousands of years. 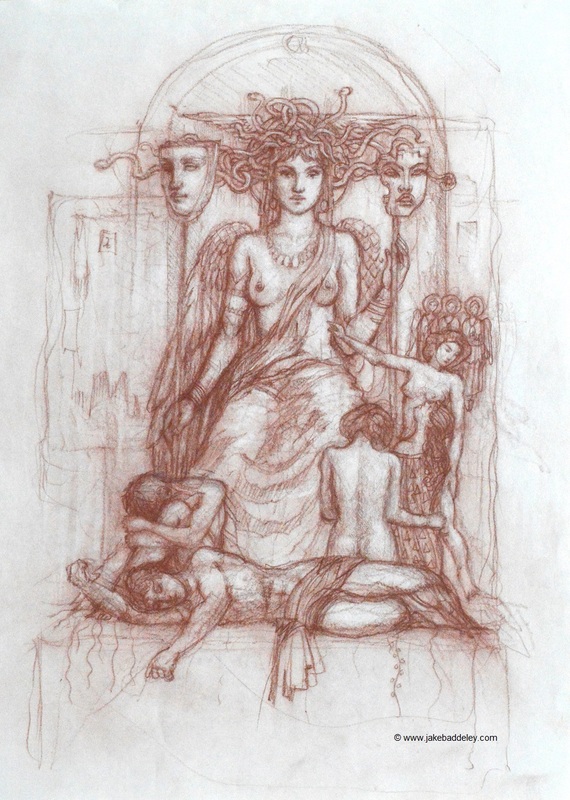 In her hair are the snakes of Medusa, who represented the dark aspect of the triple Goddess. I had great fun with the composition. It has an interlocked quality, fitting the figures in front and behind of eachother weaving a whole from many diverse parts. This is a trick I learnt from studying the work of Gustave Klimt. A favourite theme of classical and neoclassical painters was The Garden of the Hesperides, a mythical orchard where an apple tree or a grove grows, producing golden apples. 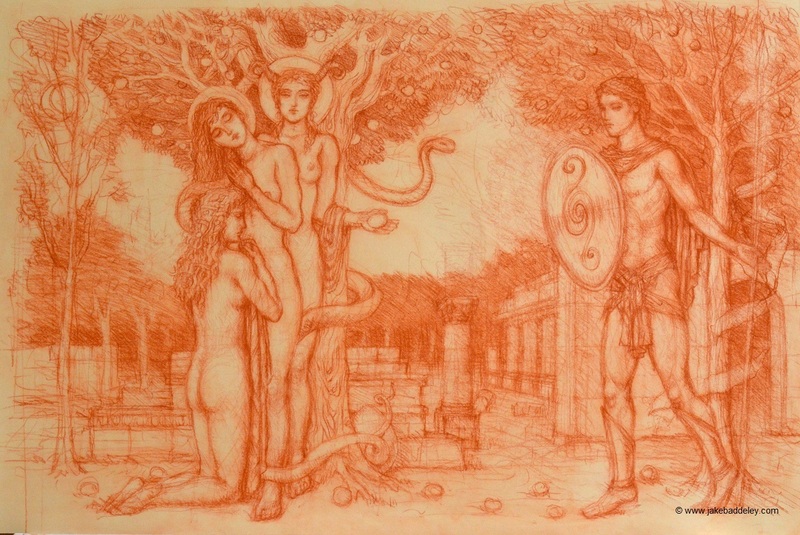 The Hesperides were beautiful nymphs who were given the task of tending to the grove. The Olympian Goddess Hera placed in the garden an immortal, never-sleeping dragon to protect the garden. There are many clues in this myth that suggest that it is a disguised reference to the Pole star or Polaris. The golden apples being the stars of the sky, and the dragon the constellation of Draco that surrounds Polaris. Oddly, many heroes of various cultures have attempted to steal these golden apples including Loki from Norse mythology and Hercules/Heracles from Greek mythology. Due to the timeless appeal of the subject and its symbolic nature, I felt drawn to make my own rendition of this myth. Here I have tried to emphasize the vulnerability of the nymphs into whose secret and sacred place a stranger has wondered.